The new European Ariane 6 launch vehicle is to embark on its maiden flight from the Kourou space center in French-Guyana in July 2020. MT Aerospace AG of Augsburg, Germany, and its Mainz-based subsidiary MT Mechatronics GmbH are constructing the mechanical launch facilities (ELA 4) in Kourou in a contract for the French space agency CNES. MT Mechatronics has been working on engineering and constructing the launching table since 2016 in a project worth 24 million euros. Bottom photo: Launch table with construction site team shortly before the final position is reached. Photos are courtesy of MT Aerospace AG. With the transfer of the ARIANE 6 launching table from its assembly site to its final position, an important milestone has been achieved in the development of the overall Ariane 6 system. Two special transporters were imported from Europe to carry the launching table, which has a weight of around 700 tons, over a distance of some 150 meters to its final position. With the achievement of this milestone for one of the major components of the launch facilities, Europe has taken a further major step forward to complete the ground segment for the new launch vehicle. In addition to the launching table, the CNES contract covers the design and the construction of the mobile pallet systems used to bring the solid-propellant boosters to the launching site, the exhaust gas stream deflector and the umbilical tower with a height of roughly 66 meters. 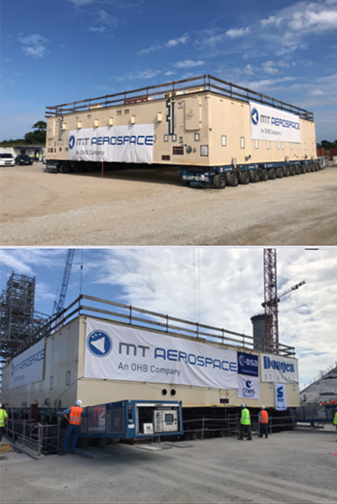 MT Aerospace and MT Mechatronics have been closely involved in the construction of all launch facilities for the six ARIANE generations as well as the SOYUZ launcher at the space center in Kourou for over 40 years.